Questions that keep me from knowing how to finish a credible, detailed model of this 30 year old vision, despite the excellent CAD tools. I just don't have the building or engineering experience to answer them myself. 1) How tall does the 8" thick crossbeam need to be at its outboard end? Currently 16" at 28.5' from main hull center-line, where it is 37" tall. a) How much of the trailing edge fairing can be cut away inside the pod/shell area at the main hull? 2) How thick is the bridge deck floor? As drawn in proa_2018_Apr28a.3dm, I have 9.5" under the leeward salon seat and 8" under the windward seat (visible on the 'interior::extend to bottom' layer). This is in accordance with the 15" two-step difference expected between galley floor and salon floor. 3) What holds up the mast? a) A transverse beam under the salon table (and mast), between the main hull and the bench seat beam to windward? 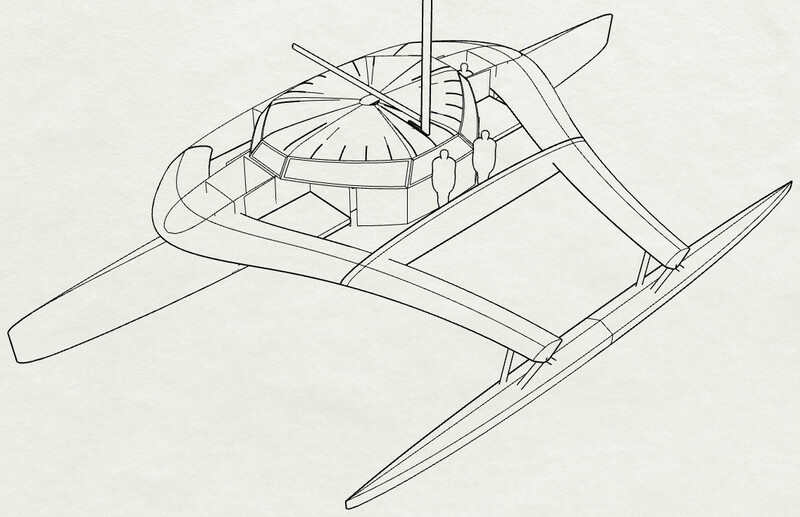 b) A 30' fore/aft truss beam under the mast, inside the pod/shell, 7.5' to windward? Either of these could affect the span remaining for the pod/shell floor, and interior space utilization. 4) How thick is that "bench seat beam" (truss) to windward? It is now 19.5" high at the center, including the seat. ~24' long at its current position, ~14' to windward of main hull center-line. Long due to wide beam separation. b) water drainage - if pooped/swamped or otherwise swept by an ocean wave, it must all drain away FAST! 5) Egress - Absurd that I haven't got a clear answer for this, but it's like using the windward cockpit for a main entrance on a Chris White or Gunboat catamaran - without headroom. a) Considering that there is a hatch over each of the four berths, one main "hatch" to the cockpit from the salon/galley should be enough. Except the height restriction at this length and the mast location both interfere with a single, central entrance. b) Two entrances, so one or the other is always aft, protected from weather. But only ~5' to 6' of head room for 7' inboard until you can step down to galley floor level from the bridge deck. Awkward! c) Single entrance, not central...?